ARK is a fantasy survival based multiplayer game. It has a single player mode but focuses on multiplayer. Platforms its available on are ps4, xbox one and PC and developed by Wild card. The game is open world as it lets you explore and do what you want on the various maps you can play on. For a survival game it has many different features and landscapes to see. The game was in preview for a few years therefore it was not full price and just became a full game last year making it full price of €60. In this game there isn't much of a focus on a story and is more focused on multiplayer but the only thing worth noting is that your character wakes up on an unknown island and has to survive and surviving on this island will be difficult as almost everything is trying to kill you. On this island are various creatures and treacherous terrains. this creatures include things such as dinosaurs, ice age creatures and mythical creatures. You can progress far enough to fight a boss of each map. this can get you many rewards but as for story telling it doesn't tell you anything and lets the player thing of what is actually happening. After beating the bosses of the game many people believe that your character was abducted by aliens and put on this island with many different types of creatures to see if they can survive. The game play is like any other survival game as you have to eat, drink, build shelter and protect yourself in order to survive. but the thing that makes ark stand out is the setting and many features within the game. As you are exploring one of the many maps you will see that the maps are very detailed and look amazing, there are many different parts to the maps and each map is different there are huge desserts, forests, oceans mountains and more to explore. 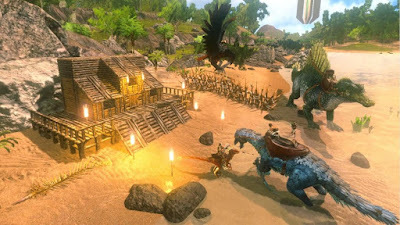 Here are many different features in the game like taming, cooking, building, trading and grouping with friends. 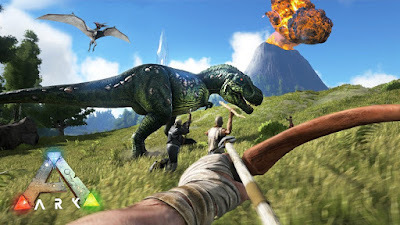 you can tame your own creatures and every animal in the game does something different and there is thousands of tamable creatures in the game but not all can be tamed. building works like a lot of other survival games you gather resources to build weapons, tools, armour, structures and many more items. But first before you can build them you must unlock them as there is a levelling system. you level up by doing any ting within in the game mostly such as crafting, fighting, taming and gathering resources. you can trade with other players in the game and team up with others which is called a tribe. Teaming up allows you to share the same buildings, tames and seeing each other on the map easier. 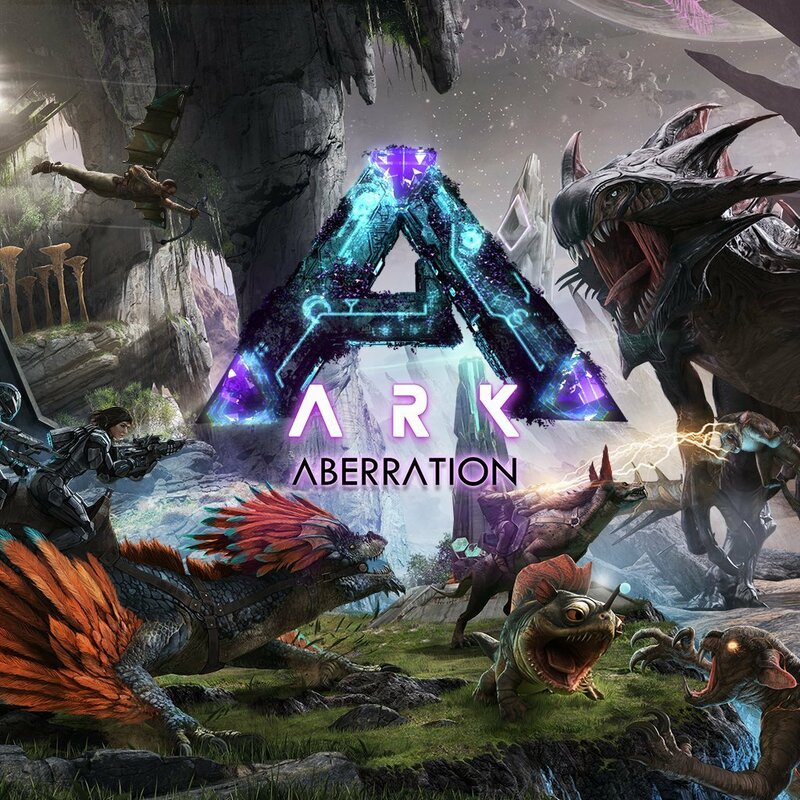 ark works on a server system there is official ark servers and ones that can be hosted by players. Official servers are run by the developers and are set to default settings. servers run by players can alter the settings to a certain extent, for example you can create a server and change how much people are aloud to join, what animals will spawn, how long day/night last, how quick animals tame and many more. The one Major problem with the game is that you need a strong connection, the connections can be quite poor and kicks you out a lot and also crashes a lot as well. This can be because of player servers but official servers can be quite laggy but wont crash as much. there are a lot of glitches in the game which cause crashes and issues all the time which is a big problem and can ruin the game sometimes. 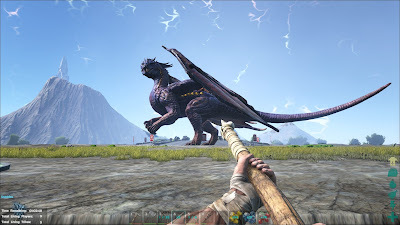 In ark the graphics are very impressive there is alot of detail and can be very overwhelming but there are some problems also. When first joining a server it takes a few minutes to render the graphics and load everything in. this is probably due to the amount of things in the game and the more players in the game the longer it will most likely take. the soundtrack is very unique and different. It suits the setting and tone of the game. Audio is very good all animals sound unique and what they would sound like its very impressive and works well most of the time. the audio is fast passed and a type of jungle vibe to the main map but each map has the same type of soundtrack just each is altered to suit the vibe of the map and some can sound a lot different. The game has a lot of content and is very grindy but fun. You can spend hours by just building, taming and gathering resources. You also have to constantly eat every 10 minutes and feed your tames as well which can take some time. There is end game rewards by beating the bosses which can take a long time to get to that level. But its just ta fun game to play with friends and try to survive. there are also a lot of dlc currently added, which add a new map and new creatures and bosses. The dlc is usually about €20. which isn't bad but i personally wouldn't buy it as the game itself costs €60 now which i think is a bit much as there can be a lot of glitches due to it being such a big game. But it is a fun game to go and replay but that's also due to that there isn't really an end game just a boss to beat and some reward and that's only if you stay on the same server long enough to get to the end game lots of the times servers will go down or could be ruined by other players. 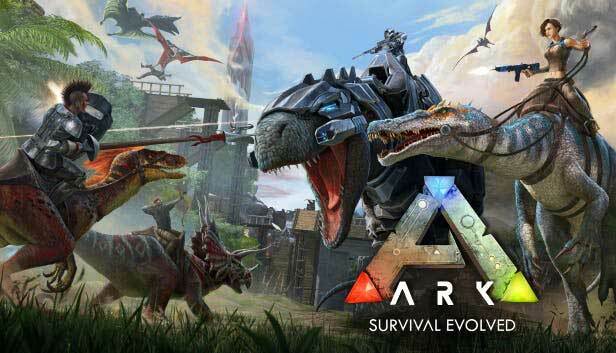 I think this game is a very good survival multiplayer game and is very entertaining. The graphics and sound are very good with a few rendering issues. the game play is good but has alot of bugs and glitches which bring it down a lot but there is a lot of content to keep you busy with lots of places to explore. 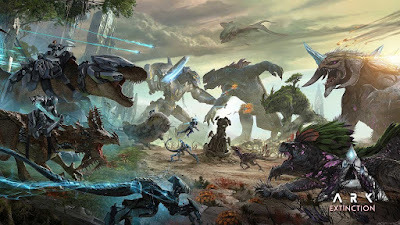 As for the the story well there isn't really a story but i don't think it needs one either as its a multiplayer game mainly, a story would be very good if it was done right and would bring the game up in standards. The game is €60 full price which isn't worth it in my opinion there is lots of content but very glitchy and full of bugs that haven't been fixed and since it was on preview for a few years it would of been a good time to get it. if you want to get this game id say wait its always on sale and you could get it €20 or €30 cheaper.